Mimmo Rotella Italian artist 1918 – 2006. 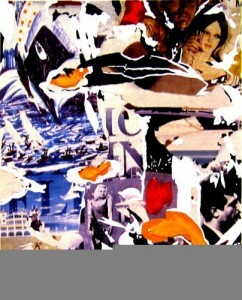 Italian artist & poet best known for his decollages. Made from torn, original period distribution & advertising posters, with their unique colourations. The Dolce Vita poster is one of the era’s most recognisable contemporary images.Featuring the film’s uber glamourous stars, Anita Ekberg & Marcello Mastroianni. A timeless visual on a par with the Andy Warhol images of Marilyn Monroe, or Jacky Kennedy. 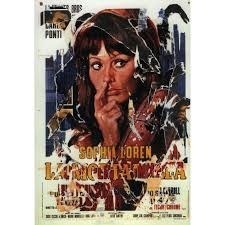 Another strong personality from “epoca” Italian cinema is Sophia Loren, who is featured in several Mimmo Rotella “decollage” posters. 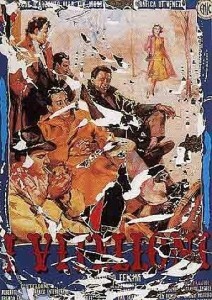 In 1997 Mimmo Rotella created a series dedicated to Fellini, a series that he titled, “Felliniana”. 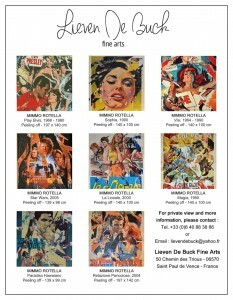 Currently a selection of Mimmo Rotella posters can be seen by appointment at the Lieven de Buck Galerie in St Paul de Vence, near Nice in the South of France. Mimmo Rotella (1918-2006) A Fellini inspired Clown…..